Definition at line 178 of file llhudeffectlookat.cpp. References LLXmlTree::addAttributeString(), FALSE, gDirUtilp, LLXmlTreeNode::getChildByName(), LLDir::getExpandedFilename(), LLXmlTreeNode::getFastAttributeString(), LLXmlTreeNode::getNextNamedChild(), LLXmlTreeNode::hasName(), LL_PATH_CHARACTER, llendl, llwarns, loadGender(), and TRUE. Definition at line 142 of file llhudeffectlookat.cpp. References FALSE, gBoyAttentions, LLXmlTreeNode::getAttributeString(), LLXmlTreeNode::getChildByName(), LLXmlTreeNode::getNextNamedChild(), gGirlAttentions, LOOKAT_TARGET_AUTO_LISTEN, LOOKAT_TARGET_CONVERSATION, LOOKAT_TARGET_FOCUS, LOOKAT_TARGET_FREELOOK, LOOKAT_TARGET_HOVER, LOOKAT_TARGET_IDLE, LOOKAT_TARGET_MOUSELOOK, LOOKAT_TARGET_RESPOND, LOOKAT_TARGET_SELECT, MAX_TIMEOUT, LLAttention::mPriority, LLAttention::mTimeout, and TRUE. Definition at line 110 of file llhudeffectlookat.cpp. Referenced by loadGender(), and LLHUDEffectLookAt::update(). Referenced by LLHUDEffectLookAt::LLHUDEffectLookAt(), loadGender(), and LLHUDEffectLookAt::update(). Definition at line 123 of file llhudeffectlookat.cpp. Definition at line 55 of file llhudeffectlookat.cpp. 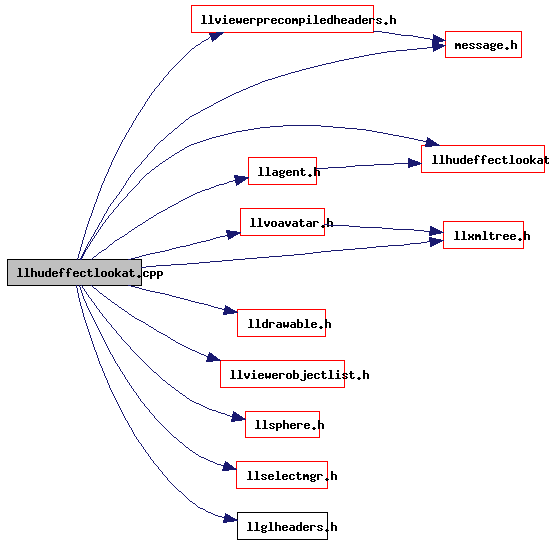 Referenced by LLHUDEffectLookAt::packData(), and LLHUDEffectLookAt::unpackData(). Definition at line 59 of file llhudeffectlookat.cpp. Referenced by LLHUDEffectLookAt::setLookAt(), and LLHUDEffectPointAt::setPointAt(). Definition at line 66 of file llhudeffectlookat.cpp. Definition at line 61 of file llhudeffectlookat.cpp. Definition at line 62 of file llhudeffectlookat.cpp. Definition at line 56 of file llhudeffectlookat.cpp. Referenced by LLHUDEffectPointAt::packData(), LLHUDEffectLookAt::packData(), LLHUDEffectPointAt::unpackData(), and LLHUDEffectLookAt::unpackData(). Definition at line 52 of file llhudeffectlookat.cpp. Definition at line 53 of file llhudeffectlookat.cpp. Definition at line 54 of file llhudeffectlookat.cpp.